The White Cliffs region of the upper Missouri River in the Eagle Creek area is one of the most beautiful sections of the waterway. 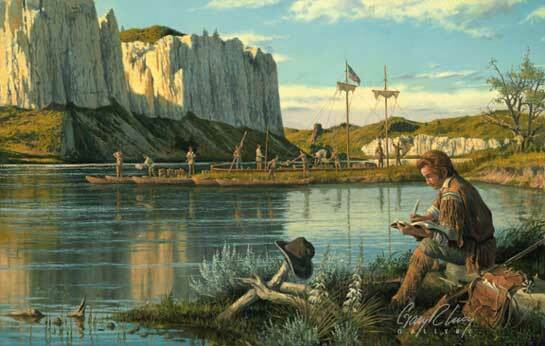 Lewis and Clark remarked many times in their journals that they were continually impressed with the beauty of the geologic structure of the landscape. In my painting, I am depicting Clark taking time to write in his journal. The men are setting up camp late in the afternoon; and, Clark is trying to find some time to be alone with his thoughts. The route traveled to this point has been long and trying. However, this new landscape is like nothing seen so far. As I travel on the river, I am continually intrigued by the thought of what is around the next bend. Today we have very detailed maps of the rivers; and, we know generally what is around the next bend. What thoughts would have been going through Clark���s mind as he takes pen in hand on the banks of the Missouri River?